I love anything cheese and anything pasta! 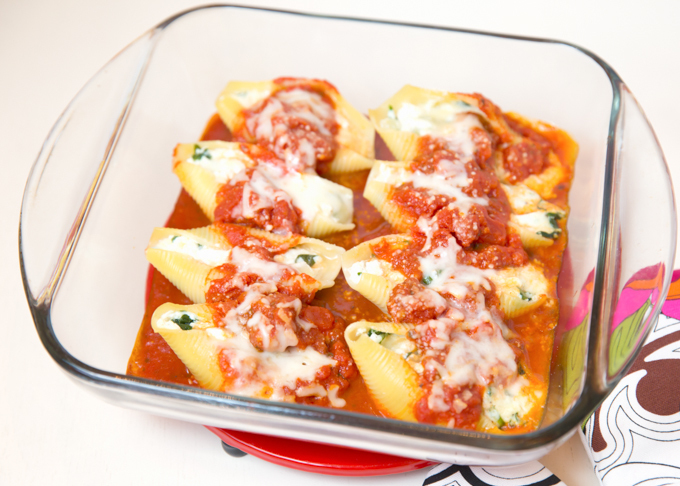 Stuffed shells were a go-to in our family when our girls were little. They were a simple dinner to get on the table and if I remember correctly, everyone liked them! 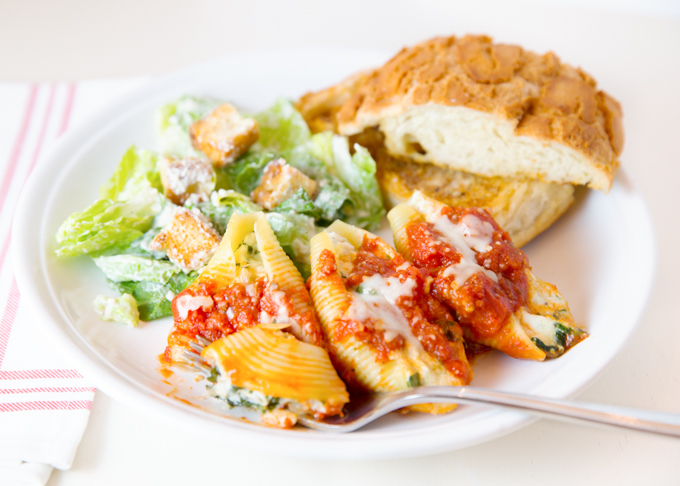 We enjoyed these Ricotta and Spinach Stuffed Shells with a caesar salad and side of garlic bread. Everything about this meal was delicious and comforting, the way good food should be. The cheesy goodness and red sauce is great for hiding all the spinach, which is also a win-win when feeding them to picky kiddos! I’m going to get real with you now, then I’ll get back to stuffing the shells…………….. I need to apologize for the lack of formal recipes, but I’ve recently realized that cooking from recipe is something that I rarely do and it was beginning to stress me out. How could I make it as a food blogger if I don’t have recipes? It’s also been pointed out from a few “young moms” that they don’t cook from recipe on a regular basis and prefer meal ideas or inspiration. Something that they can put together for a quick, easy, and tasty meal that their family will enjoy. I know that’s how I grew up cooking and that is what I strive to do with this blog. Inspire busy young moms to get dinner on the table without too much stress and fuss. Eat together as a family. I remember when our girls were young, that every Monday morning, I’d sit down (with a cup of coffee), and write out our dinner meal plan for the week. Then I’d head out to the grocery store. I’d get ideas from each of the girls on what they’d want that week and incorporate their ideas in every week. Dinner had to include either a vegetable or salad. Sometimes both. I’d look at the week’s schedule. Hmmmm, dance, soccer practice, basketball, birthday parties, homework, and the list only got busier as they got older. Ok, what nights could we all sit down together? What nights had to be a reheat kind of dinner? Do we have other dinner plans during the week? I typically shopped for 4-6 dinner meals per week, depending on the craziness of the week, and this typically allowed for a night of leftovers. Something pasta, something chicken, something beef, a casserole type meal. I tried not to repeat too often. Rarely did I pull out a recipe. Ah-ha! I don’t cook from recipe, unless of course, I’m baking. Confessions of a food blogger. Back to the stuffed shells now……….. Begin by cooking your large pasta shells in a big pot of salted water. Cook according to package directions, but undercook by a minute or two. Drain and cool slightly. Saute about a half (more or less depending on size) of a med. yellow onion (chopped). Add in 3 pressed garlic gloves. Once onion/garlic is translucent, add in a bag of fresh spinach (I chopped mine up prior to cooking). Cook for a couple minutes to wilt spinach, then remove from heat. In a large bowl, combine lg. tub ( 32 oz.) ricotta cheese, 1 cup grated parmesan cheese, 1/2-1 cupped shredded mozzarella, 1 egg, and some salt, pepper, and little nutmeg (about 1/4 tsp). Mix well until combined. *Optional, add a cup of fresh chopped basil (in addition to spinach or instead of). Add spinach mixture to cheese mixture and mix well. For a full box of shells and the above mixture, you’ll need 2-3 jars of your favorite pasta sauce (or homemade if you prefer), depending on how saucy you like them. Pour a little sauce on the bottom of two large baking pans (9×11). Gently stuff the pasta shells with the cheese mixture and place open side up in saucy pan. Top with more sauce and some grated mozzarella and a sprinkle of parmesan. Cover with foil. Bake at 350* until hot and bubbly. About 30 minutes. **This is a great freezer recipe. I made up a small pan for us for dinner and froze two med size pans. A freezer of homemade food is a good thing! I am a massive fan of big pasta shells.. with lots of stuffing! As a child they were my favourite thing ever. 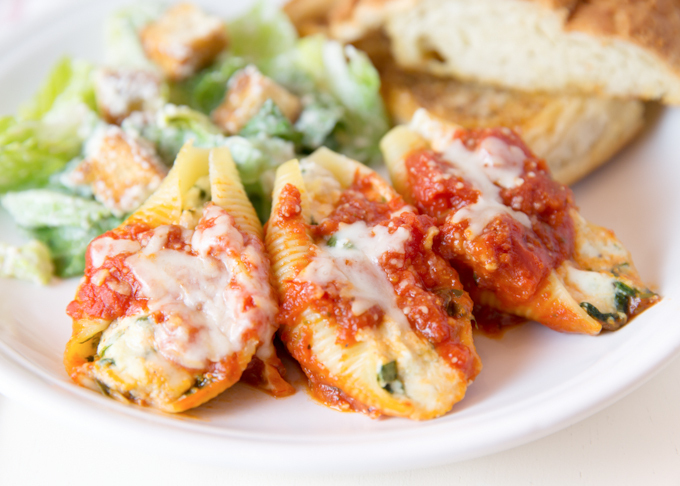 Thanks for reminding me how much I love stuffed pasta – I am so inspired to make this. Thank you Thalia! These were a huge hit when our girls were little. They still are! Thank you Jen & Emily. My family loves them too! !